October 19, 1984. From the boundary of the Siskiyou National Forest downstream to its confluence with the Rogue River. Wild — 28.7 miles; Scenic — 17.9 miles; Recreational — 3.8 miles; Total — 50.4 miles. 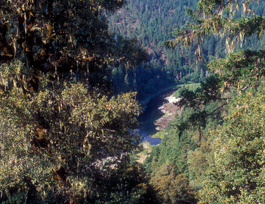 Located in southwest Oregon, the Illinois Wild and Scenic River flows from the Rogue River-Siskiyou National Forest boundary to its confluence with the Wild and Scenic Rogue River, a distance of 50.4 miles. The river's outstandingly remarkable values are scenery, recreation, fish, botany and water quality. The river offers marvelous recreation opportunities, including whitewater that provides plenty of excitement for small rafts and kayaks. The wild section flows through a steep canyon for 29 miles between Briggs and Nancy Creeks, featuring 150 rapids, of which 11 are Class IV and one, is Class V. This section is reputed to be the most remote, inaccessible river segment in the lower 48 states. Permits for floating the Wild Illinois are necessary year-round, but are not restricted and there is no fee; primary boating season is March through mid-May. Still, clear, blue-green pools offer contrast to the whitewater segments of the river and opportunities for catching anadromous fish, including large steelhead.